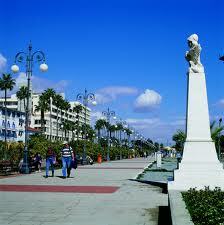 Most travelers first see Cyprus at Larnaka, which is the second port and the site of an international airport. No welcome could be sunnier: at Larnaka, deep blue seas meet bright sand beaches under incomparably brilliant skies. Palm Tree Promenade Here yachts and sailing vessels from around the globe bob and glint, and along the harbor perimeter is a palm-lined promenade. Between shopping trips to Larnaka’s international-caliber boutiques, inviting cafés offer shady resting spots and sweeping ocean views. 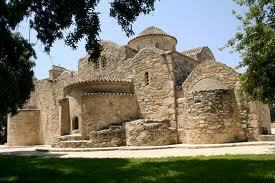 The promenade winds its way to a striking finale, the Larnaka Medieval Museum, housed in a 17th-century fort. Make your way north from the fort, toward the center of the city, and you will come to one of Larnaka’s and the island’s most cherished sites — the church of St. Lazarus. After his resurrection from the dead by Jesus, Lazarus elected to live out his “second” life as Bishop of Cyprus. He is reputedly buried in a crypt under the main altar. The beautiful interior of the Church of St. Lazarus Originally called Kition in the days of the Old Testament, Larnaka reached a heyday as a commercial center in the 1700’s, when the consulates were established here. One of the oldest, continually-inhabited cities in the world, Larnaka abounds with sights. Nearby is an 18th-century aqueduct, and two wonderful museums — the Larnaka District Archaeological Museum and the Pierides Foundation Museum.